Violinist Keila Wakao, aged 10, began study at the age of three with Mrs. J. Riggs. Developing rapidly, the late Joseph Silverstein accepted Keila as a student at the age of six. Subsequently she studied with Suzan Gessner and Eiichi Chijiiwa (2013, Orchestra de Paris, France). She currently studies with Donald Weilerstein, Julianne Lee, Anait Arutunian, Ying Xue, and Keisuke Wakao, receiving additional music instruction with Lail Davidson at the New England Conservatory Preparatory School. Despite her young age, Keila has proven herself as a serious, competitive violinist. At the age of seven, she won the Forte International Music Competition (New York, New York). This was followed by 1st place wins at the 8th Yokohama International Music Competition (Japan, 2014), and 1st place at the New York International Competition for Young Artists (New York, 2016). Most recently Ms. Wakako performed Mozart's Concerto in D Major, KV 211 and Meditation from Thais with the Metrowest Symphony Orchestra (2015). In her spare time, Keila enjoys reading, drawing, fashion design, and studying the Japanese language. Born and raised in Connecticut, Julie Reimann began playing the cello at age nine. She began studying privately with Aldo Parisot, cellist and professor of music at Yale School of Music and formerly Juilliard School, at age thirteen. Under his tutelage Julie performed throughout the United States, Canada, and Brazil, and won a number of music competitions, including Gold Medal in the New Haven Youth Symphony Young Artists Competition, First Prize in the Connecticut Chamber Orchestra Young Artists Competition, and Second Prize in the Fischoff National Chamber Music Competition Junior Division. Julie earned her Bachelor of Music degree in 1992 from Curtis Institute of Music where she was a student of David Soyer of the Guarneri String Quartet. During her four years at Curtis Julie was an invited performer in the Nationale Academie de Violoncelle in Paris, France, as well as the Banff Music Festival, Rencontres Musicales d’Evian, Musicorda Music Festival, and Norfolk Chamber Music Festival, and performed in the United States, Canada, and Europe. She won First Place in the Alliance Auditions National Music Competition in 1991, and was Principal cellist of the Curtis Symphony Orchestra by her last year there. Julie graduated from Bryn Mawr College’s Post-baccalaureate Premedical Program in 1994, where she received the Horace Alwyn Prize for the student who contributed the most to musical life on campus. Julie continued to perform solo and chamber music recitals while pursuing her M.D. and Ph.D. in Biophysics at Stanford University (including in the Fortnightly Chamber Music Series in Palo Alto and the Soiree Musicale Chamber Music Series at Villa Montalvo), and during her residency and fellowship in Boston. She continues to perform chamber music as well as solo recitals locally in various venues, and is principal cellist of the Waltham Symphony Orchestra. She is also a practicing pathologist in the Newton, MA area, specializing in dermatopathology. THOMAS STUMPF RECEIVED HIS DEGREES IN PIANO PERFORMANCE FROM THE MOZARTEUM IN SALZBURG, AUSTRIA, AND THE NEW ENGLAND CONSERVATORY OF MUSIC IN BOSTON. HE WAS AWARDED THE BÖSENDORFER PRIZE AND THE LILLI LEHMANN MEDAL. HE HAS APPEARED WITH THE HONG KONG PHILHARMONIC, THE BOSTON POPS ORCHESTRA (UNDER ARTHUR FIEDLER), ALEA III (UNDER THEODORE ANTONIOU), AND THE LEXINGTON SYMPHONY. STUMPF IS A WELL-KNOWN COLLABORATIVE PIANIST, AND IN THAT ROLE, HE HAS PERFORMED WITH RITA STREICH, EDITH MATHIS, D'ANNA FORTUNATO, RICHARD STOLTZMAN, JACK BRYMER, WALTER TRAMPLER AND LESLIE PARNAS. HE HAS PREMIERED MANY COMPOSITIONS BY CONTEMPORARY AMERICAN COMPOSERS AND IS A COMPOSER HIMSELF. 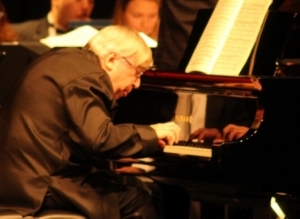 STUMPF'S COMPOSITIONS HAVE APPEARED ON CONCERT PROGRAMS IN BOSTON, THROUGHOUT THE U.S. AS WELL AS IN GERMANY AND THE U.S.S.R.; IN 1992 HE WON THE KAHN AWARD FOR HIS MUSIC THEATER PROJECT "DARK LADY," ONE SECTION OF WHICH WAS RECORDED ON THE NEUMA LABEL BY SOPRANO JOAN HELLER. IN 2005, HIS CHORAL WORK “THOUGH I WALK” WAS PREMIERED AT ST. BARTHOLOMEW’S IN NEW YORK CITY BY THE PHAROS MUSIC PROJECT. HE IS DIRECTOR OF MUSIC AT FOLLEN CHURCH IN LEXINGTON, MA, WHERE HE HAS CONDUCTED THE SENIOR CHOIR IN MANY MAJOR CHORAL WORKS, FROM BACH'S ST.MATTHEW PASSION AND MOZART'S REQUIEM TO BRITTEN'S "CEREMONY OF CAROLS" AND THE SACRED CONCERTS OF DUKE ELLINGTON. HE ALSO CONDUCTS THE FOLLEN YOUTH CHOIR, AND DIRECTS THE YOUTH AND JUNIOR CHOIRS EVERY JUNE IN FULLY STAGED, DOUBLE CAST PRODUCTIONS OF GILBERT AND SULLIVAN OPERETTAS. HIS EXPERIENCE AT FOLLEN HAS LED TO HIS FIRST BOOK: A COLLECTION OF ESSAYS ENTITLED "A SOUNDING MIRROR: COURAGE AND MUSIC IN OUR TIME," PUBLISHED IN 2005 BY HIGGANUM HILL BOOKS. HE IS ALSO THE CO-FOUNDER AND ARTISTIC DIRECTOR OF PRISM OPERA, AND HAS CONDUCTED AND DIRECTED MOZART'S "LA CLEMENZA DI TITO" (IN HIS OWN TRANSLATION), AS WELL AS OPERAS BY BRITTEN, VAUGHAN-WILLIAMS AND HOLST. STUMPF HAS TAUGHT PIANO AT THE NEW ENGLAND CONSERVATORY AND BOSTON UNIVERSITY (WHERE HE WAS CHAIR OF THE COLLABORATIVE PIANO DEPARTMENT FROM 1990 TO 1997). HE REGULARLY GIVES MASTER-CLASSES AT THE MUSIKSCHULE IN MANNHEIM, GERMANY. HE CURRENTLY TEACHES AT UMASSLOWELL (WHERE HE HAS BEEN THE HEAD OF THE KEYBOARD DEPARTMENT) AND ON THE APPLIED MUSIC FACULTY AT TUFTS UNIVERSITY.